Moody’s Economy.com released its housing market forecast for 2010 and the results were glum for most of the nation, with only one of the 100 largest metropolitan markets forecasted to experience price appreciation. Mark Zandi, chief economist for Moody’s Economy.com pointed to the sluggish employment picture and the stubbornly high foreclosure rate as factors that will keep the overall housing price down for another year in 2010. Zandi expects that another 2.4 million houses will have to clear foreclosure in 2010, and predicts that will be too much downward pressure to offset recovering markets. The good news is that Moody’s expects this year to be the last of the decline. “It’s clear we’re closer to the end of this crash than the beginning,” says Zandi. Housing is more affordable, and construction is still low, so sales will eat up excess inventory. “We’re moving in the right direction, and that’s reason for optimism,” he says. Pittsburgh’s appreciation is a reflection of the stability of the region, which also means that the market did not enjoy the unsupported price appreciation that occurred in other regions in the middle of the last decade. Like eight of the other ten best markets, Pittsburgh’s median price is still below $140,000. 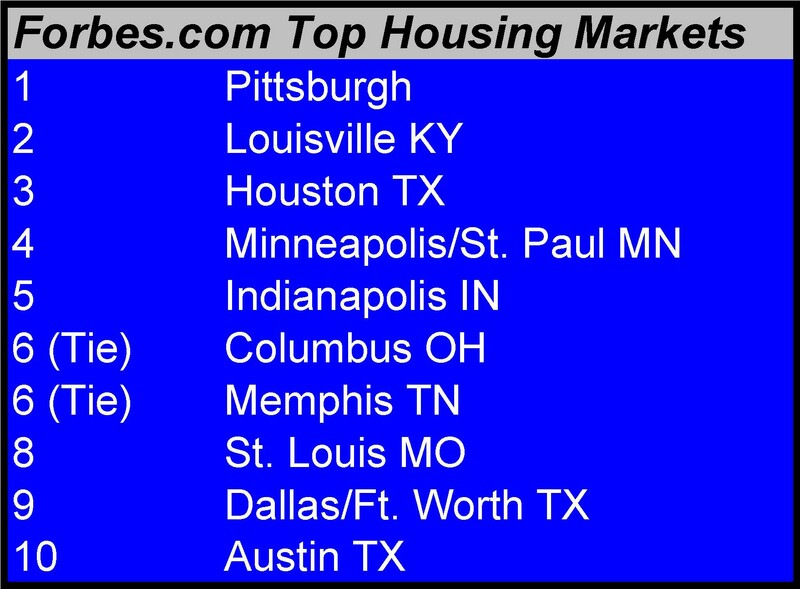 On February 19 the online magazine Forbes.com released its list of the ten best markets to buy a house and ranked Pittsburgh number one. Using the Housing Opportunity Index, a metric created by the National Association of Home Builders and Wells Fargo, the magazine said Pittsburgh’s appreciating prices, affordability rating and low number of foreclosures, which help keep prices stable, all factored into the city’s ranking. This entry was posted in Real estate news, Regional Economy. Bookmark the permalink.